GENEVA, ILLINOIS — The Chicago Steel clinched the #2 seed in the Eastern Conference with the team’s 8-1 win over the Muskegon Lumberjacks Saturday night. With the second seed, the Steel earned a First Round bye and will have home ice advantage in the Eastern Conference Semifinals. Chicago will host Game 1 and Game 2 of the Eastern Conference Semifinals on Saturday, April 20 at 7:05 p.m. and Sunday, April 21 at 5:05 p.m. 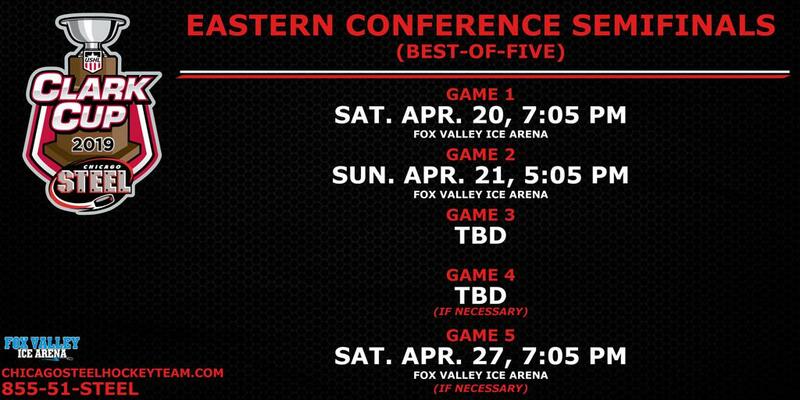 The full series schedule for the Eastern Conference Semifinals will be released once the Steel’s opponent is determined following the First Round series. Chicago will play the highest remaining seed, while top seed Muskegon will play the lowest remaining seed. Chicago will play the top remaining seed of the following three opponents if they advance to the Eastern Conference Semifinals. Chicago has won four of the six meetings with Youngstown this season, including a 2-0-1 record at Fox Valley Ice Arena. Forwards Gunnarwolfe Fontaine (6-2-8), Nick Abruzzese (2-6-8) and Mathieu De St. Phalle (2-6-8) have led the Steel offensively against the Phantoms this season. Youngstown has been paced by forward Brett Murray who finished second in the USHL with 75 points this season. The Buffalo Sabres prospect led the USHL with 41 goals. Youngstown goaltender Chad Veltri has played 35 games this season with a 21-8-3-2 record, 2.86 goals against average and .902 save percentage. Steel netminders Justin Robbins and Reilly Herbst each have a pair of wins over the Phantoms this season as Herbst is 2-0-0-0 with a .889 save percentage and 2.50 goals against average compared to Robbins’ .841 and 3.51 marks. The Steel have taken three of the five contests against the RoughRiders this season, including earning seven of 10 possible points. Abruzzese has also paced his team against Cedar Rapids with four points (0-4-4) in five games. Fontaine has the second-best point total with three points (2-1-3) in five games. Fontaine and forward Robert Mastrosimone are the only players with multiple goals against Cedar Rapids this season. RoughRiders forward and Winnipeg Jets prospect Nathan Smith has led his team offensively with 53 points (18-35-53) in 59 games this season. Goaltender Blake Pietila is third in the USHL with a 2.31 goals against average this season while his .912 save percentage is fourth. The netminder holds a 29-13-3-1 record this season. Robbins has appeared in all five games for Chicago against Cedar Rapids with a 3-1-1-0 record, .917 save percentage and 1.99 goals against average. Chicago has secured seven of a possible eight points against Team USA U17 this season with a 3-0-1-0 record. If the Steel matchup with Team USA, it will be against a roster composed primarily of this season’s U17 roster. Abruzzese leads the team with seven points (4-3-7) and is one of three players to record a point in every matchup. De St. Phalle has five points (2-3-5) in four games as does forward Neil Shea (2-3-5) in three games played against Team USA U17. Forward Matthew Beniers paces Team USA U17 skaters with 31 points (11-20-31) in 33 games while goaltender Drew Commesso has played the bulk of the games with a 5-12-0-4 record, 3.48 goals against average and .889 save percentage. Herbst has played in three of the four games with a 2-0-1-0 record, .864 save percentage, 3.59 goals against average and an assist. Robbins holds a .903 save percentage and 3.00 goals against average in his lone appearance. The winner of the Eastern Conference Semifinals matchup will advance to the Eastern Conference Final against the winner of #1 seed Muskegon Lumberjacks and their Eastern Conference Semifinals opponent. Single game tickets for the Eastern Conference Semifinals are on sale now. Fans who previously purchased tickets for Monday, April 15 will have their tickets transferred to Saturday, April 20 and tickets previously purchased for Tuesday, April 16 will be transferred to Sunday, April 21. Fans that purchased tickets for possible games on April 15 and 16 may exchange their tickets between Games 1 and 2 before Friday, April 19 by contacting the Steel at 855-51-STEEL. The minimum number of tickets to receive group pricing will be 10 during the Clark Cup Playoffs, though all tickets for the “Buy One, Get One, Give One” offer will only be available at single-game pricing, which starts at just $10. Fans still have the opportunity to secure playoff tickets through the team’s March Madness and Pay as We Play programs. With March Madness, any fan that purchases a new Mini-Plan for the 2019-2020 season – starting at just five games for $45 – will receive a free ticket to the team’s first home playoff game. New 2019-2020 full season ticket holders receive a free ticket to all Steel playoff games this season. The Pay as We Play program allows fans to lock in the same seat to every home playoff game.